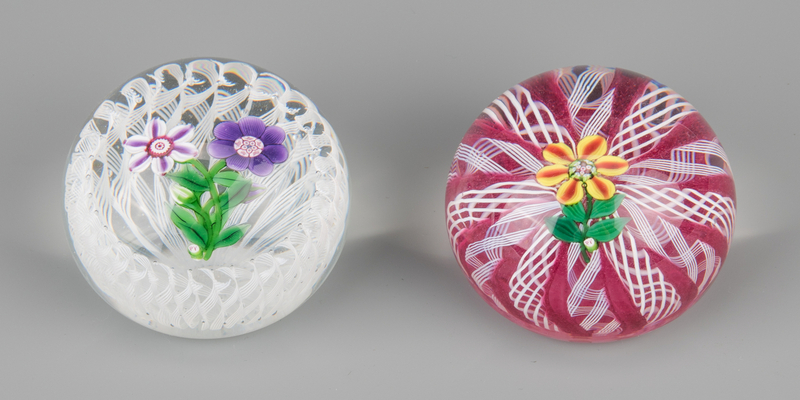 2 Paul Ysart paperweights.1st item: Yellow striped flower with millefiori center over a red and white latticino ground. Signature cane "PY" at stem. Retains original sticker. 3" dia. 2nd item: Paul Ysart lampwork paperweight with purple floral bouquet over a stave basket and white latticino ground. "PY" signature cane at base of stem. Retains original sticker. 3" dia. CONDITION: All excellent to very good condition.